Delivering The Redburn to a Family in the Duck Lake Area. The Hunter’s began researching the possibility of a brand new home when they moved out to their farm in the Duck Lake area. It took about five years of researching and consideration before making the decision to build with B&B. They wanted to make sure that they found the plan they liked, and a builder they felt comfortable and confident with to build their forever home. An RTM seemed to be the most practical way to get the home of their dreams. 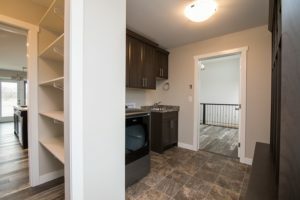 With their location, getting a builder and trades to come out and build it from top to bottom onsite would have been extremely difficult and would have cost a fortune with mileage charges. They decided on an RTM because it would be complete and they would be able to move right in within a reasonable timeline. The Hunters were living in a mobile home on their farm and with their boys getting bigger and a large extended family, they really wanted to have more room. They wanted a home to their host friends and family and not feel like they were trapping them in a tiny box. The Hunters wanted to have a big entry area conducive to their farm life. 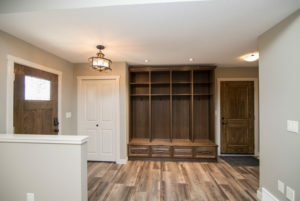 The lockers, laundry and half bath have been the best value functional areas to have in their new farmhouse. They also wanted to have a large kitchen so that everyone can come and sit down to have harvest meals in. 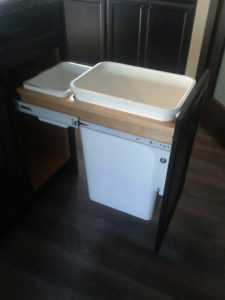 As well as lots of room for cooking and storage for all of their kitchen accessories. What’s One Piece of Advice Would You Share With Anyone Planning a Custom RTM Home? “Research your builders! Make sure you’re not settling and that you find exactly what you are looking for. What Did You Like About Working with B&B Homes? Where do you start…..from the very beginning we knew right away that we would choose B&B. Darwin was the only one in all of the companies that we went to that took the time out of his busy schedule to take us and show us their homes. He showed us homes right from starting out construction to the finished product. He explained the differences in construction and what we should be looking for in a home. Not once did he ever make us feel pressured that we had to choose them. He just gave us all the information that no one else took the time to care to show us. By the end of the tour we knew that we wanted to deal with B&B. 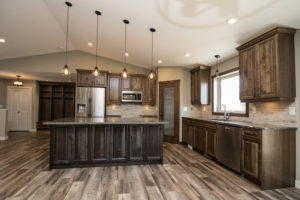 We loved the fact that they only took on so many homes in a year and that they put all of their effort into making those homes the best that they could. They truly cared about the product that they put out there. When we met Katia she made such an overwhelming project seem so effortless. She made sure that we were happy with everything and went above and beyond to make sure we had exactly what we wanted! She is a true gem to work with. We can’t believe how beautiful our home is….we are a little biased but we think its the best designed home ever! It was so nice as a homeowner to hear that it was whatever we wanted our house to be! They had constant communication with us about everything and encouraged us to come out anytime to see the progress of our new home. It was like watching the best Christmas present ever being built from start to finish! It was very much like a family environment where we felt welcome by everyone! Working with our on-site designer can help you bring a vision to life that you didn’t know was possible for a new RTM home. Contact B&B Homes today to coordinate a complimentary consultation with our designer here. Delivering the Ironstone to Central Butte for a Young Family. 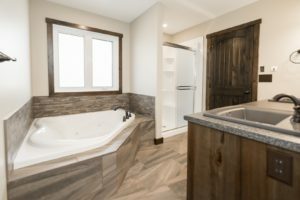 The Peterson’s spent about a year thinking about what they wanted for their future RTM home and met with various builders before they came across the layout of the Ironstone and decided to work with B&B. 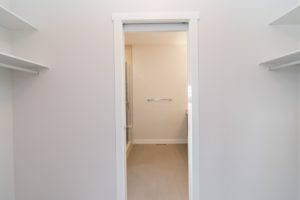 The deciding factor for them was having the kitchen and dining room off the back of the home, a layout that was very difficult to find when they were looking at floor plans. Everything else in the Ironstone design seemed to fit with what they were looking for, from the fireplace to the tray ceilings; they felt it was truly beautiful home, and one they wanted for themselves. Rachel and Brennan knew immediately that the Ironstone was exactly what they wanted for their future home. What do you love about living in your new RTM home? “Seeing the way everything came together blew us away. We always say to each other, can you believe this is our home? It’s such a great feeling to see all of our choices come to life to create the home we had always dreamt of. What advice would you give to someone planning an RTM project now that yours is completed? Working with our on-site designer can help you bring a vision to life that you didn’t know was possible for a new RTM home. Contact B&B Homes today to get started on designing your own custom floor plan here. Building a Functional Layout with Vaulted Ceilings for a Mantario Family. 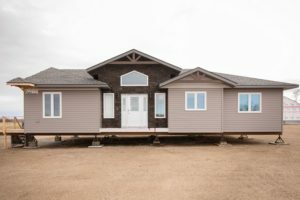 The Massey’s had recently moved from a mid-sized Saskatchewan city back into a 1939 farmhouse in the yard of their family farm. They were planning to renovate the home, but after only a few weeks of living in it, they decided to build. They just had a newborn son and their daughter was only three, so they wanted to make plans with the long term in mind. They would have had to move to renovate and the costs in their heads were adding up very quickly. 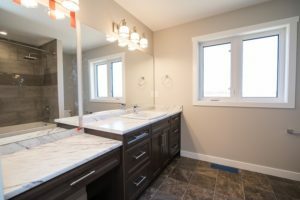 Even with a very costly renovation, the house still wouldn’t have met their needs as a young family so it made the decision easy to start planning a custom RTM home that would. Delia spent about a month checking out different builders, styles, financing, moving costs, etc. Since she was at home with her kids at the time, she had quite a bit of time to commit to the process. The Massey’s were looking for quality and start to finish contracting. 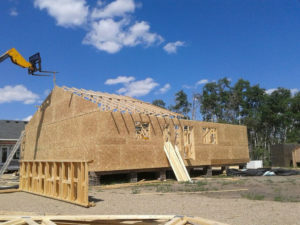 They were surprised how many RTM builders there were in the Saskatoon area alone and that could deliver to their remote farm. A company that did start to finish was very helpful especially with attaining financing for the entire project. What advice would you give to someone planning an RTM project now that yours is over? “I have a few major pieces of advice. First, get your financing in order long before you plan to start building. That was a very long three months in our case and held things up on our end. Especially when we were so anxious to start! Trust me when I say that I researched pricing. I must have got 6-8 basement quotes and not a single one covered everything B&B did OR was less than their price. We also thought we could do our garage cheaper locally. Though we have a fantastic local contractor, it’s definitely cost us more. B&B is very competitive and if I could go back and sign that contract for everything at the beginning, I would. Costs fluctuate on material and that would have saved us a lot of money. “Having an in house designer helped a lot. All the selections are very overwhelming and Katia was very helpful in helping to make decisions. Also, this is a family owned and operated company. The first person we met face to face was Travis as he accommodated us visiting on a weekend. Coming from an entrepreneurial family, I can appreciate the level of commitment that usually comes from family owned businesses. He cares about the company and the quality of homes it produces and that was evident right from the beginning. 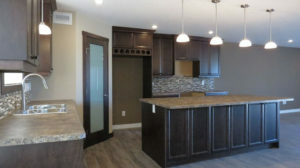 Building an RTM With Ranch Style Finishes for a Family Outside of Maple Creek. The Beierbach’s engaged with B&B Homes after seeing a floor plan call out their name that was shared on Facebook. With some modifications to The Redburn to make it truly their own, the rest is now history and they are living in their custom RTM today. 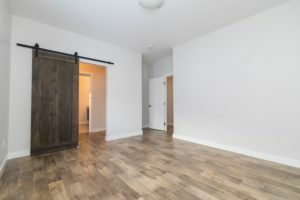 When it came to looking for an RTM builder, they were looking for flexibility to suit their ranch style, good quality construction and of course affordability. 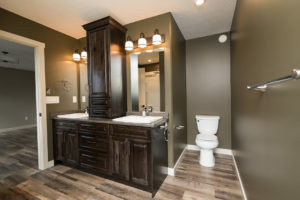 They also needed to look into RTM options due to their remoteness in the Maple Creek area and for the convenience of outsourced project management around their busy lifestyles. 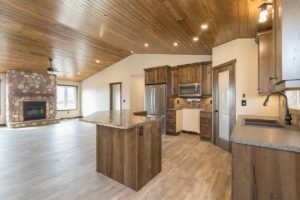 With an open concept and more living space than their previous small farmhouse, they are now more comfortable hosting guests and entertaining at their home and seem to do a lot more of it these days. Donna spent around three months researching different features and finishes online that would capture their style and preferences. B&B was impressed with all of their unique ideas that were able to be executed. Their home like all custom RTMs was quoted based on the custom specs that were put together specifically from Donna and Williams’ researching and planning. During this time they also talked to friends, neighbours, relatives — anyone they knew that had either built or moved in a new home. What One Piece of Advice Would You Share With Anyone Planning a Custom RTM Home? 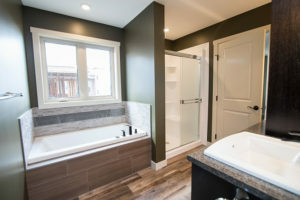 After coming off a bad experience with another builder, the Kernahan’s mortgage broker Cari Skjerven, suggested they build with B&B Homes. 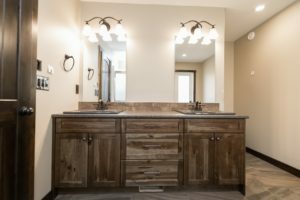 After going on B&B’s website and finding their dream home design and receiving some helpful advice when calling in, it sealed the deal for them to work with B&B Homes. Now the rest is history! 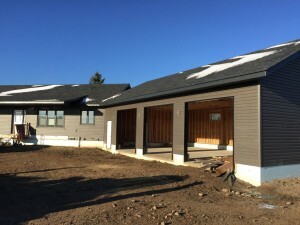 Mike and Jennifer worked with B&B Homes for their entire project from start to finish, from the foundation pour to the RTM build, and the onsite build of a three car garage. See how this home transformed into a dinner party hosting haven with the help of B&B Home’s onsite designer. Since Jennifer and Mike both spend a lot of time cooking in the kitchen and are very social, designing a kitchen that met these needs was one of the most important aspects of their home. Mike and Jennifer had a lot of fun working with B&B’s on-site designer Katia to make their dream kitchen come to life! As they live far away, it was nice to see the progress of the house being built and to communicate through co-construct on any issues that needed to be addressed, as their house was being built. 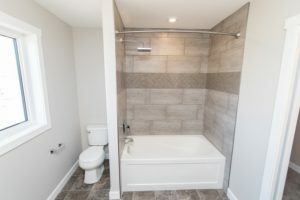 It was also a major selling feature to not have to worry about looking for other contractors to do the eaves troughs, basement cement work or garage doors. Since the garage was built on site and the shingles put on in the late fall, due to the late timing they didn’t get a chance to tab down properly. After two weeks of windy weather and one day of extreme winds, a small part of the shingles started lifting and a few started to come off. After they assessed the damage they contacted Darwin at B&B. In less than a week, B&B’s service team came out and repaired the missing shingles and went over the whole roof and tabbed down anything that was slightly loose. The Kernahans were really impressed on the speed of which their claim was dealt with. Especially for the distance they are from the B&B site just outside of Delisle, that this was dealt with in a speedy manner. Delivering an RTM Onto an Existing Foundation Outside of Moose Jaw. 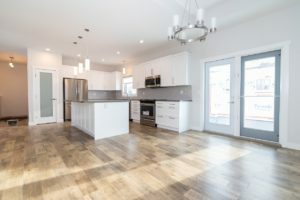 When Mandi Odynski and Jesse Corcoran originally first engaged with B&B Homes, they wanted to know what their options were to put a new RTM home on an existing foundation on some land they owned just outside of Moose Jaw. Travis, B&B Homes’ President headed out to their farm to take some measurements so B&B’s on-site designer could draft what would be possible for a pure custom home design that would fit the dimensions. 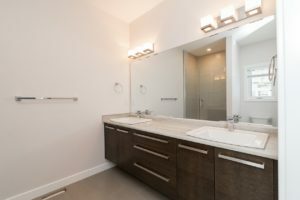 Once it was determined that their existing foundation was usable for a new RTM home, Mandi and Jesse began working with Katia, B&B Home’s designer to plan a custom home that would suite their lifestyle. 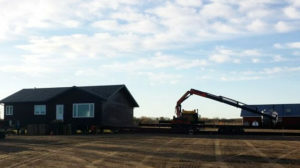 Not long after, B&B Homes delivered an RTM home covering 1427 sq feet to their land. They were able to utilize existing plumbing and included some new ICF insulation in the foundation for a future DIY basement. 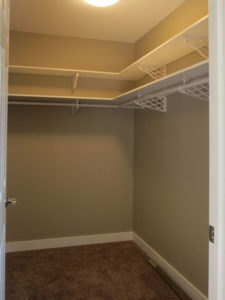 The design of the basement included room for bedrooms later on down the road if needed. 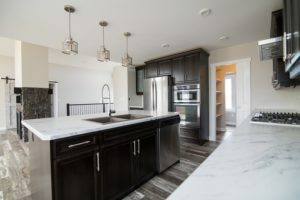 B & B Homes was able to move up our delivery date and hired an amazing crew that immediately eased my worries regarding the placement of our home on the foundation! Mandi and Jesse heard about B&B Homes through their friends. 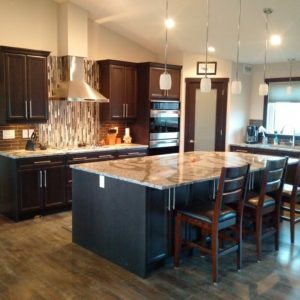 They chose to work with B&B Homes over other builders because they liked the product, price and finishes they saw in their friend’s home. They heard B&B Homes was really good to work with, which they were able to confirm themselves after a few site visits and agreed.